The final adventure. 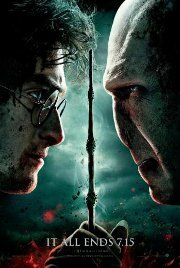 In this epic finale, the battle between the good and evil forces of the wizarding world escalates into an all-out war. The stakes have never been higher and no one is safe. But it is Harry Potter who may be called upon to make the ultimate sacrifice as he draws closer to the climactic showdown with Lord Voldemort. It all ends here. This film is releasing in both 2D and 3D, this is the 2D version. Drat. Wand is out of bullets again! Produced by Heyday Films, Moving Picture Company, Warner Bros. Pictures, Warner Bros. Comments Last of Harry Potter films. Strongish suspense and menace and somewhat intense pace. The ''violence'' is mitigated a bit by its fantastical nature but could be nightmarish for younger viewers.